Patek Philippe was established in 1851 between Antoine Patek and Jean A Philippe. This duo layed the foundation which allowed Patek Philippe to dominate the Swiss watch industry for over 150 years. In 1863 they invented the 'free mainspring' that lead to the invention of the automatic watch. In 1889 they invent a special 'Perpetual Calendar' which for the first time, keeps track of how many days in each month and knows when it's leap year. The 'split second' chronograph is patented by Patek in 1902. 30 years later, the last family members seek out caretakers to direct the company and sell the firm to the Stern family who still own the brand today. The Stern family have been conscientious protectors of the virtues that make Patek Philippe the best and the status and regard of the world of connoisseurs and collectors has never been higher. Fifty of the fifty-three highest prices ever paid for watches at auction were Patek Phillipe. The classic 'Patek Philippe Annual Calendar' (Patek ref. 5035) has a round case enhanced by 18 K roman numerals that show the hours. The intricately crafted automatic movement is visible through the anti-reflective Sapphire exhibition case back. A sub-dial 9 o'clock shows the days of the week, the sub-dial at 3 o'clock shows the months of the year, and a 24 hour sub-dial is located near the 6 o'clock position. Precisely at 6 o'clock is a magnified window showing 'todays date'. The 'Patek Philippe ref. 5035P' aka 'Patek Annual Calendar Model # 5035-P' is a beautiful example of the style and excellence that are trademarks of this fine company. This boldly beautiful luxury watch is also available with a moonphase function; 'Patek Philippe Annual Calendar with Moon ref. 5146' features an Annual Calendar with Month, Day, Date, Power Reserve, Moon Phase and Center Sweep Seconds. 'Patek 5146' is a beautiful blend of precision and elegance. The extremely sought-after 'Patek Philippe Mens Platinum Annual Calendar Chronograph Ref. 5960 P' was the first Patek Philippe self-winding chronograph with Annual Calendar and the manufacture caliber CH 28-520 IRM QA 24H. The new platinum version (ref. 5960P) with the matt blue dial emphasizes the dynamic personality of this timepiece. The 'Patek 5960P' is an extremely hot commodity. Other notable 'Patek Philippe Annual Calendars' are: The 'Patek Philippe 5396G Annual Calendar with Moon Phase', 'Patek 5450P - Advanced Research Annual Calendar', 'Patek 5147G Annual Calendar Moon Phase with Diamond Bezel', 'Patek 4936 Annual Calendar Ladies Diamond Bezel' and the rectangular 'Patek 5135J Calendario Annual Calendar'. The 'Patek Philippe Aquanaut' is the perfect dress sports watch. Created with a gently rounded octagonal shaped steel or gold case, and avail on bracelet (Patek ref. 5167) or strap (Patek ref. 5165) the 'Patek Philippe Aquanaut' is the epitome of casual chic. The dial of the 'Patek Aquanaut' features a unique grid pattern and the hours are marked by gold applied Arabic numerals and luminous hour hands and index markers. The self-winding movement is automatic and assures a high rate of accuracy. The Patek 'Aquanaut' includes a screw-down crown and Sapphire crystals for both the case back and the dial. The sporty, yet stylish 'Patek Aquanaut' is water resistant to 120 meters, making it perfect for the ballroom, boardroom or the beach. For the ladies, Patek Philippe created the stylish 'Aquanaut Luce'. The case is avail in various metals and set with 46 sparkling diamonds, the gorgeous embossed dial comes in black or white with gold applied Arabic numerals, and the 'Patek Aquanaut Luce' is available on strap or bracelet. This beautiful Patek Philippe women's watch is also water resistant to 120 meters. 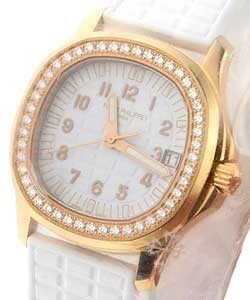 Also for the ladies as well as the gentlemen is Patek's famous signature watch model the 'Calatrava'. Classic and timeless, the 'Patek Calatrava' showcases sleek design and elegance, and is the epitome of Patek Philippe perfection. Impervious to overnight trends, the 'Patek Philippe Calatrava' line is one watch that will always be in style, and can be handed down, generation after generation. Available extra thin, with hobnail patterns or with wide polished bezels, there is no doubt that each and every 'Calatrava' watch can be worn with any outfit and to any occasion. 'Patek Calatrava' watches come on bracelet or strap and with many different dial colors and patterns.